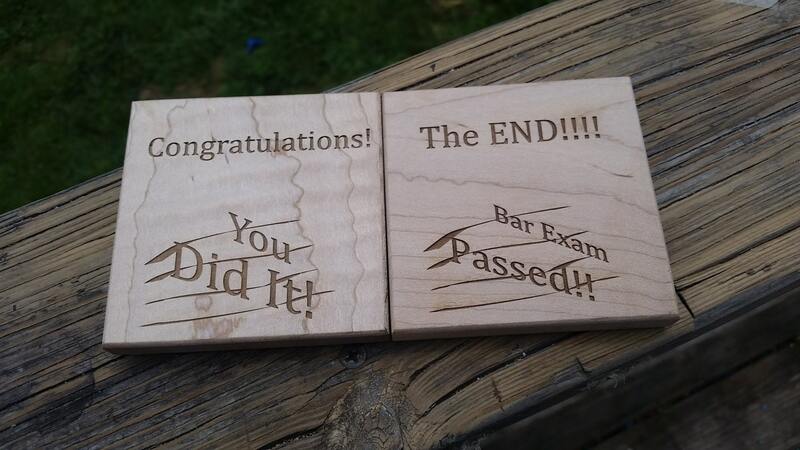 Oh what a nice way to tell someone that passed their Bar Exam congratulations! Our uniquely crafted crafted and engraved coasters are a one of a kind gift. Over the lines of a notebook paper the words YOU PASSED and BAR EXAM PASSED are going to bring a smile to the face of the gal or gentlemen that studied long and hard to pass it. On top each coaster is engraved with Congratulation! and The End!. WOW what a great feeling to have! Each coaster is crafted & engraved by us from curly maple wood, black walnut or aromatic eastern cedar trees. Each coaster can be custom personalized as per your request. Size: 3.5 inch square x 1/2 thick. Lead time 3-5 business days. Let us know if you need them sooner. Thank you for browsing FineGiftsEngraved! Don't forget to book mark this page for an easy return. We will accept all major credit cards with transactions being processed via Pay Pal or Direct Checkout. Also we will accept Money orders but your order will not be process until the money order has cleared. Please ensure it is sent with a tracking number so we know where it is in the event it is not received. We ship USPS Priority mail with delivery confirmation for US orders. On large orders we will ship Priority Mail or UPS If time permits we will choose the least expensive option if not otherwise requested by you. ****ALL SHIPPING UPGRADES INCLUDING EXPRESS OR AIR UPS WILL NOT SHIP TIL PAYMENT FOR THE UPGRADE HAS BEEN RECEIVED. Please check our listings for lead time. Our average lead time is 5-7 business days. If you need something sooner we would LOVE to accommodate your need by date. Just let us know. On orders over $100.00 a signature may be required when package is delivered. If you have a preference in shipping carriers please email us as we may be able to accommodate you. We will also ship directly to a third party if you would like to send an item as a gift. It will be packaged ready for gift giving. For international shipping please allow 4-8 weeks to receive your order. All international orders ship via first class unless otherwise requested and upgrade paid by the customer. International shoppers: All local custom fees are the responsibility of the buyer. ** We do not provide local pickup or personal deliveries at this time. ** Unclaimed items that get returned will NOT be refunded. If you want the item to be reshipped it will have to be at the customer's expense. ** Items that show delivered can not be claimed as lost only via the shipping carrier. In the event damage occurs during shipping we will replace your order with proof of damage. (pictures of any damaged items in an email). We will have delivery confirmation on all packages to make sure they get there. If for any reason they don't, please email us and we will work with you to resolve the issue. We strive to have only happy customers and positive feedback. If for any reason you are not completely satisfied please email or convo us right away so we can come to a resolution. CUSTOM ITEMS ARE NOT REFUNDABLE ONLY IF WE MADE A MISTAKE IN MAKING THE ITEM. In the event that any other is returned that is not customized there will be a 30% re-stoking fee. Items that show delivered to the address provided to us at checkout will NOT be replaced if lost or stollen. Unclaimed items that are returned or not claimed will not be refunded. Thanks again for visiting our shop.